We offer Semi-Electric Counterbalanced Stacker that is specially designed for loading and transporting the goods of factories and warehouses. 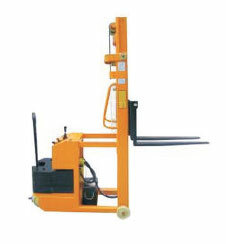 The Semi-Electric Counterbalanced Stacker has compact design that allows it to perform swiftly in narrow passages. This Semi-Electric Counterbalanced Stacker is known for its flawless functioning and longer service life.